The Parish Magazine of August 2004 for St Mark's Church (Wyke) has devoted its centre pages to the 200th Anniversary of the Bible Society or to give it its full title 'The British and Foreign Bible Society' founded in 1804. Although a number of organisations already existed in the 17th Century for the systematic dissemination of Bibles, this was the most famous and influential of all Bible Societies. Similar societies were quickly established in Scotland (The Edinburgh Bible Society in 1809), Ireland (The Hibernian Society in 1806) and throughout Europe and the Western World. Today there are but a few countries that do not possess an established society. A little known early specialist Bible was the "Bib'lia Pau'perium" (Bible of the Poor), produced in the Middle Ages and consisting of a number of pictures of Biblical subjects accompanied with appropriate accompanying text. 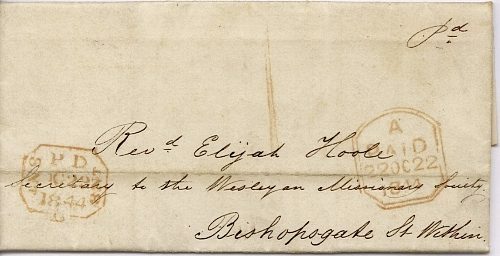 Resolved it be recommended to the General Committee to grant the sum of £1,000 to the Wesleyan Missionary Society towards the expenses incurred by them during the last 14 years in obtaining translations of the Scriptures into the Caffre tongue. I have much pleasure in transmitting the above resolution. It will require confirmation of our Council on the fourth Monday of the month before it can be acted upon but I do not hesitate to send it to you now. I can assure you that your replies to Mr Joustle's enquiries have afforded us very great satisfaction - and they will sanction the above resolution. We shall mark her of those among the friends of the Society. I propose sending a copy among others to the Bishop of Norwich; and I should be much obliged if you could give me a little additional information about the "Clicks". The Bishop lately made some enquiries upon this point, which I was not in a condition to meet.